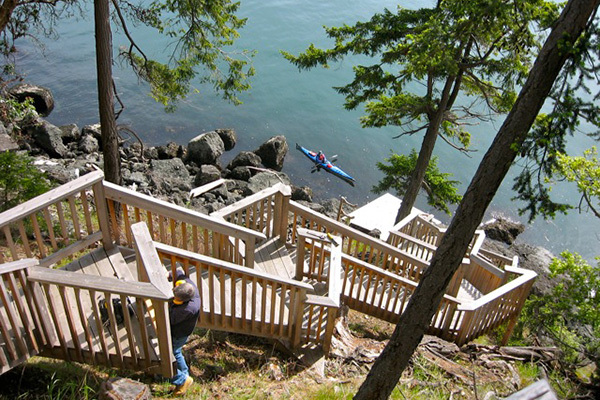 Specializing in outdoor stair construction and water access solutions over steep and rugged terrain. Enhance your outdoor living environment and increase your property value. Increase your acreage, enjoy and feel?the connectedness of land and sea? We create safe and unobtrusive access solutions that harmonize?with the natural environment, while a solid, functional and ?safe means?to access your?waterfront. Peter Christenson is the owner and head designer at Shoreline. ?Peter’s artistic eye and years of experience allow him to?envision what needs to be done while keeping the?utmost respect and love for nature. At the enthusiastic age of twelve, Peter worked by his father’s side building everything from homes to docks, learning the value of hard work, commitment and workmanship. As a young adult, Peter owned one of the most successful dock building companies in the Muskokas (Ontario, Canada). Over the years, Peter’s talents and his strong desire for challenge have lead into a natural progression, realizing the ever-growing need for water access on a greater scale. It is risky business, yet Peter has an obvious natural talent for this kind of work. 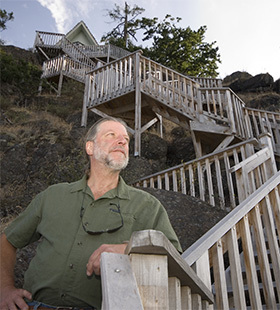 Building with rock, stone and wood for over 35 years he has created a unique style, specializing in water access over steep and rugged terrain. Proudly serving Calgary to the Kootenays, The Okanagan to the Coast! A Functional investment both to increase property value while creating a comfortable living ambiance around lake and ocean front properties. Actualize your vision with Peter’s knowledge and expertise. Peter’s vision will be one of a kind designed for your unique property working with the land and elements maintaining environmental integrity while giving you a tasteful and safe outdoor living space. Enjoy safe access for people and pets of all ages. ?Decks, walkways, pathways, beach access, a blend of elements, designed with stone, wood and rock, to inspire your imagination. With the expertise of Shoreline Design, anything is possible! Share your vision with Peter for a creative collaborative approach and allow Peter’s experience to inspire all?possibilities.